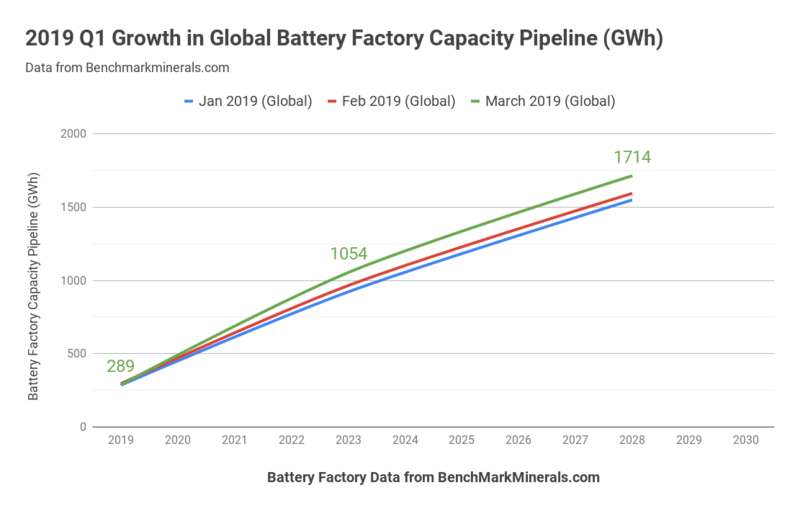 Global Lithium-Ion Battery Planned Capacity Update: 9% Growth In A Single Month — March Charts! Another month has passed, and yet another 89 gigawatt-hours (GWh) of lithium-ion battery factory capacity has been added to the planning pipeline for production in 2023. This represents growth of 9% in just a single month (more than 100% annualized growth)! Planned annual battery output by 2023 has now crossed 1,000 GWh of capacity, and over 70% that capacity is in China. There’s enough global lithium-ion production capacity in the pipeline to supply over 21 million EVs each year (around 25% of the global vehicle market) by 2023. 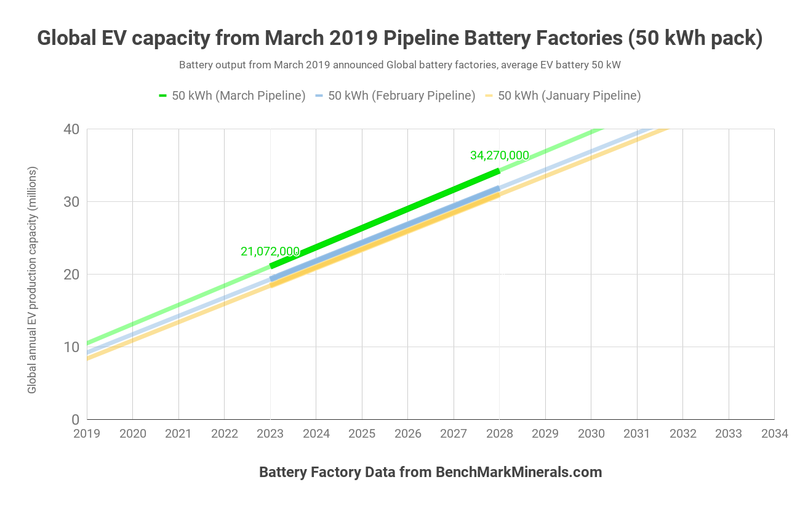 The industry standard Lithium Ion Megafactory Assessment from Benchmark Minerals records and details the March 2019 increases to the pipeline for battery production capacity. The planned annual production capacity being brought online by 2023 rose from February’s score of 964 GWh, to 1054 GWh by the end of March. That additional 90 GWh represents a growth of over 9% in planned capacity, arriving over the course of a single month, on top of the 4% growth we already saw in February over January. As I mentioned in last month’s update, there’s still plenty of scope for the planned 2023 production capacity to increase further still. The rapid progress at the Tesla Shanghai Gigafactory (Gigafactory 3) — from breaking ground to product output in less than 12 months — illustrates how fast factories can come online, especially in China. We can expect much more planned capacity to be added to the 2023 horizon between now and then. More distant horizons (2025, 2028, and so on) obviously have even more scope for capacity planning. It’s notable that China keeps extending its already substantial lead in planned lithium-ion battery capacity. Currently, over 70% of planned capacity for 2023 is in China. Significant additions in March came from Great Wall Motors/SVolt (Jiangsu factory), Sunwoda (Nanjing factory), and EVE Energy (Huizhou factory), amongst many others. Much more detail is contained in the Benchmark report. As we stand today, the planned battery capacity in China is sufficient to enable local annual production of almost 15 million EVs by 2023, 18 million by 2025, and 23 million by 2028. There’s every probability that this can increase further as time goes on. My thanks again to Benchmark Mineral Intelligence for the underlying data. Benchmark produce the industry’s most comprehensive regular monthly global assessments (of battery capacity, lithium supply and pricing, and many other key areas of the battery supply chain), of great value for any business working in this area. Let’s have a straw poll of what total 2023 pipeline capacity we will see on the table by the end of the first half of this year. I’ll be able to report the June figures in mid July if all goes well (3 months from now). Will the total 2023 pipeline break 1800 GWh? 2000 GWh? Even more? Jump in and share your thoughts in the comments.